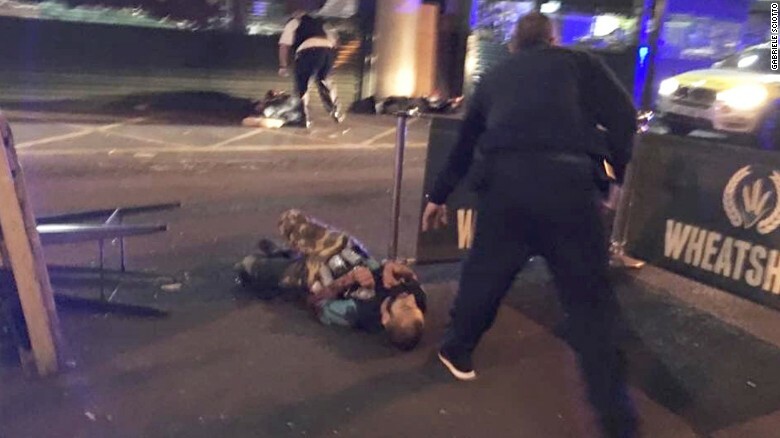 The attack began just after 10 p.m. local time on London Bridge, just north of an area bustling with cafes and bars, and near the London Bridge rail and underground interchange. Mark Roberts, who was on the bridge at the time of the attack, told CNN a van mowed down pedestrians as it sped south across the bridge, leaving bodies lying in the roadway. Another witness, Brad Meyers, said he saw someone jump off the bridge into the water in order to escape being hit. 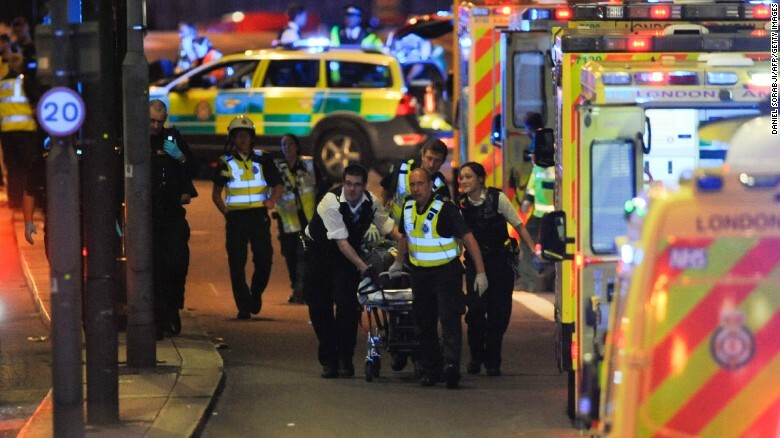 Police officers and members of the emergency services attend to a person injured in an apparent terror attack on London Bridge. 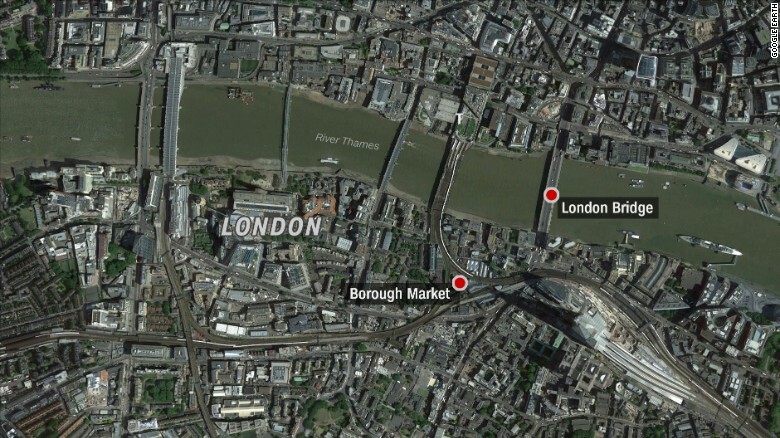 The cafe stabbings occurred in Borough Market, a popular market with gourmet food and produce stalls and several restaurants inside. A witness said they were in the front of Elliot’s when a large group of people started running up the street from Borough Market. 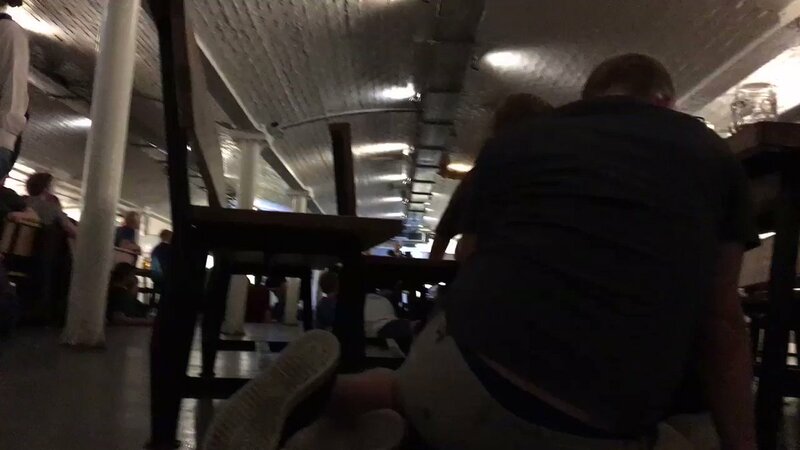 “Someone said, ‘What is going on?’ and one of the people running said, ‘There is a man with a knife up there and he is coming this way.’ There was complete panic as everyone ran to the back of the restaurant and crouched down trying to hide themselves from view,” the witness said. Image from London’s Borough Market shows two people lying on the road. Police activity is visible nearby. “A man suddenly appeared in the restaurant with a massive knife — some people in the restaurant believe there may have been another man — but it was so chaotic it was hard to tell,” the witness said. The man with the knife stabbed a waitress, who was hiding behind a partition, in the neck and stabbed a man in the back before running out of the restaurant, the witness said. Another witness said a masked man entered El Pastor restaurant down the street and slashed a woman in the side with a knife. Applebee told his customers to go to the back of the restaurant. He said he started to pull down his shutters and turned around to see three men standing outside, one holding a machete. One wore “this sort of belt,” he said. The men just looked at the people in the restaurant and Applebee said he didn’t know what to do. The men went down the street, so Applebee and a colleague pulled down the shutters. Five minutes later they heard gunshots. They went to the staff room upstairs where they heard more gunshots. About 90 minutes later, police evacuated the restaurant, he said. Police activity spread throughout the Borough Market area. Officers rushed into the nearby Katzenjammers bar and ordered people to sit on the floor, patron Paul Connell told CNN. London Bridge Tube station was closed and London Bridge was closed in both directions. The Metropolitan Police confirmed there would be “additional police and officers deployed across the capital” in the forthcoming days. Saturday’s incidents also come more than two months after a man drove an SUV into a crowd on the sidewalk along Westminster Bridge in London, killing at least four people. The assailant, Khalid Masood, 52, of West Midlands, reportedly had a criminal record and may have had connections to violent extremism, British Prime Minister Theresa May said. CNN’s Alex Felton, Carol Jordan, Matt Wells, Antonia Mortensen, Paul P. Murphy and Donie O’Sullivan contributed to this report. Next articleHave you ever suffered an ailment?